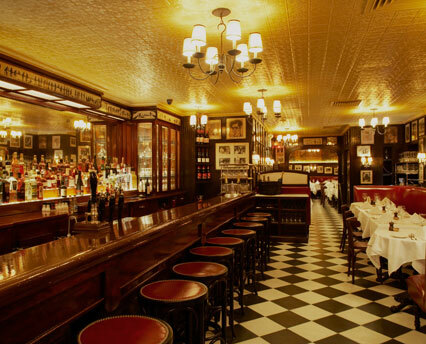 Minetta Tavern has been around for a while now. Since 1937, actually. And yet, somehow, it is still impossible to get a reservation less than a month in advance for any time other that 5:30pm or 11:30pm. Minetta is simply one of the coolest places in the city, probably partly as a result of its long history and being a regular spot for celebrated writers such as Ernest Hemingway, Ezra Pound, Eugene O’Neill, and E. E. Cummings. When it was redone by the team behind Balthazar, Pastis and Schiller’s in 2008 (Keith McNally, Lee Hanson, and Riad Nasr) it was put on the map as a culinary force to be reckoned with. The atmosphere of Minetta as they describe it on their website is like a mix of Parisian Bistro and a steakhouse. With dim lighting, checkered floors, tin ceilings and red leather benches, you could really imagine yourself sitting at the bar musing with a writer or drinking absinthe in a dark corner of the back room. While it is difficult to get a reservation at the restaurant, once you do the service is quite on point. You are greeted upon arriving by a bouncer at the door who lets you in if you have a reservation. This might be a little pretentious but it definitely keeps the bar from becoming overly packed. Good thing because we were seated over an hour late. We would have been very cranky except that the hostess graciously kept checking in with us and brought us a complimentary glass of champagne to ease the wait. Throughout dinner as well our waitress was friendly and informative and courses were well timed. You don’t come to Minetta for a light meal. So, if you have a big event where you need to fit into a dress/suit, I would try to push that reservation out a little bit. 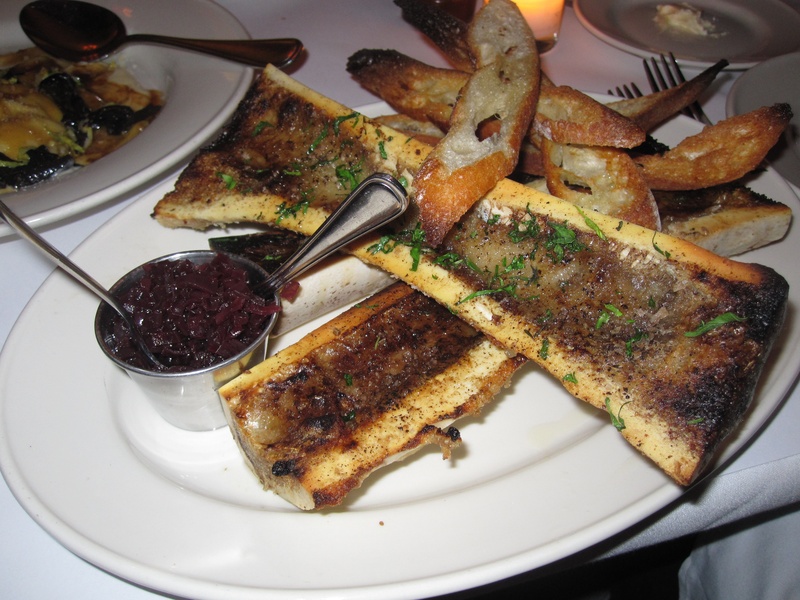 To start we had two orders of the bone marrow for the table which is incredibly rich and decadent. Huge bones grilled with a salty crust and served with a shallot confit and crispy toast. This must be shared unless you plan on entering a food coma immediately after being seated. 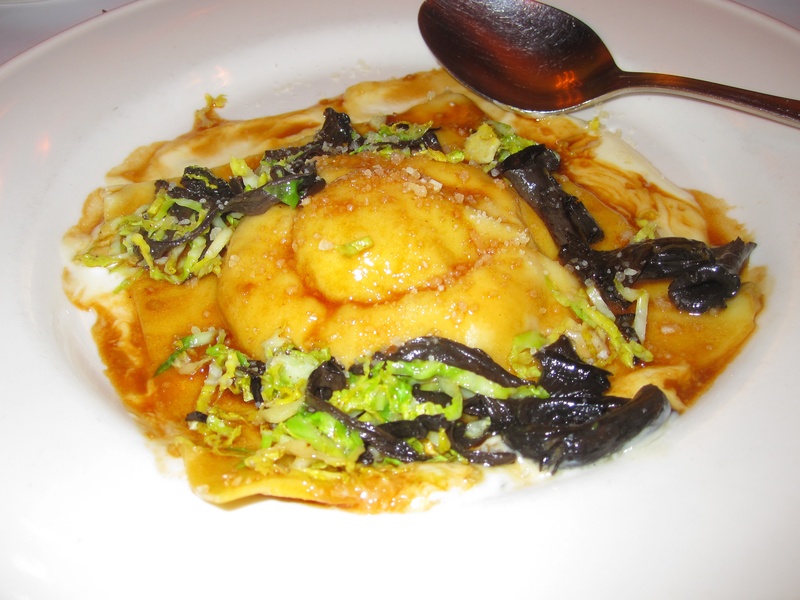 The second appetizer we shared as a table was the special raviolo. This one giant raviolo was filled with cheese and butternut squash and encapsulated one warm, runny egg yolk which acted as a sauce. Yes, the Black Label burger costs $26 but it’s really worth every penny. 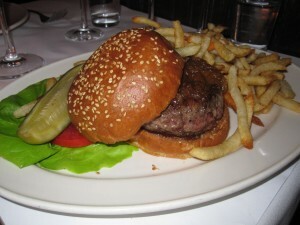 This is the only burger I have ever ordered at Minetta but the dry-aged prime beef really makes it special. 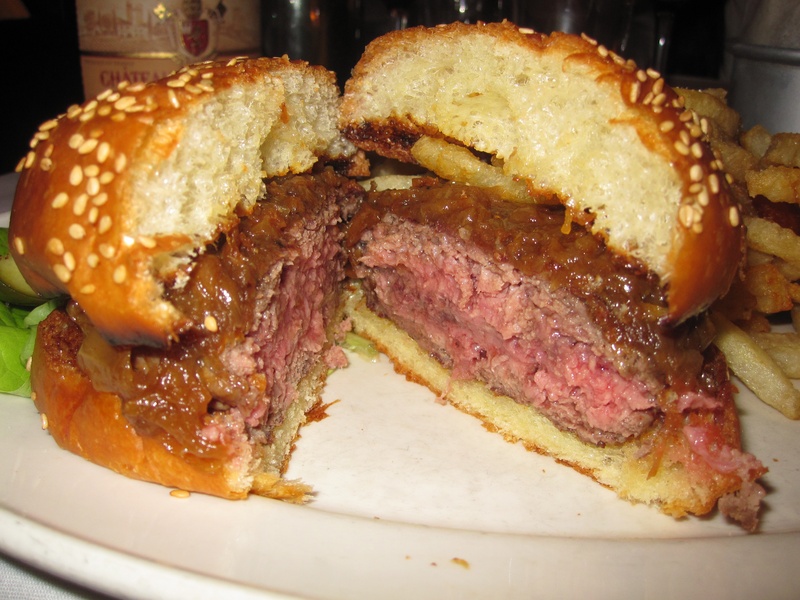 The topping they recommend to accompany the juicy burger is just a single spoonful of carmelized onions. No cheese. No lettuce. No pickles. This burger is in my Top 10 for sure. 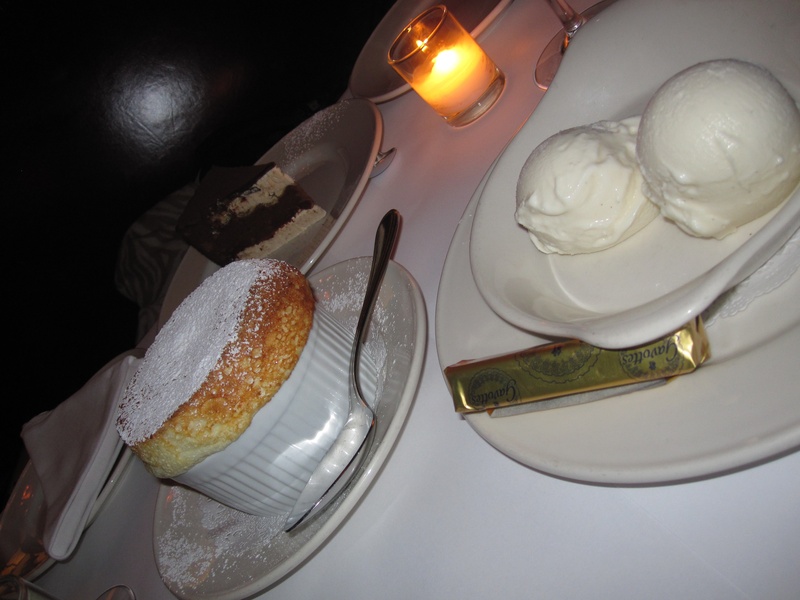 What could be a better end to a meal than a fresh out of the oven soufflé? Two fresh out of the oven soufflés, obviously. We ordered one each of the chocolate and the Grand Marnier soufflés for the table. Both were executed perfectly and were the right size for four of us to each have a few sweet bites to complete the gluttonous meal.